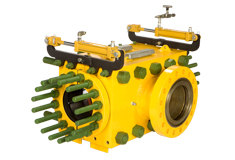 The Oil States QCS QualiTee is a pipeline fitting that allows the operator to connect two pipelines without shutting down the line. Fittings are available for both structural and non-structural applications. Inboard collet-style grips ensure firm gripping of the pipe during installation. The grips are pinned to the inner body to prevent dislodging during installation. Units from 8″ to 24″ are typically in stock for fast turnaround. Collet gripping system, which is pinned to the inner body, so they cannot become dislodged during installation. Standard full-pressure, end-load structural reinforcement. Reduced pressure boundary and longitudinal seal length.